In 1921 Miro drew the farmhouse where he spend his childhood. The kaleidoscopic painting is brimming with details. 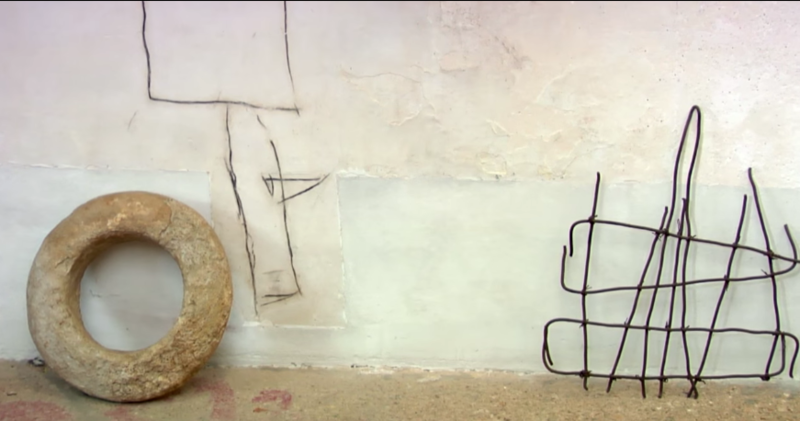 Miro’s focus is on the consistency of the farmhouse wall, the cracks, the surface and its texture. This painting accompanied Miro when he moved to Paris and it served as a constant reminder of where he came from. The painting is a kind of prism that captures what inspired Miro throughout his life: walls, stones, mundane things. San Boto – studio and home he loved. His collections and white walls. 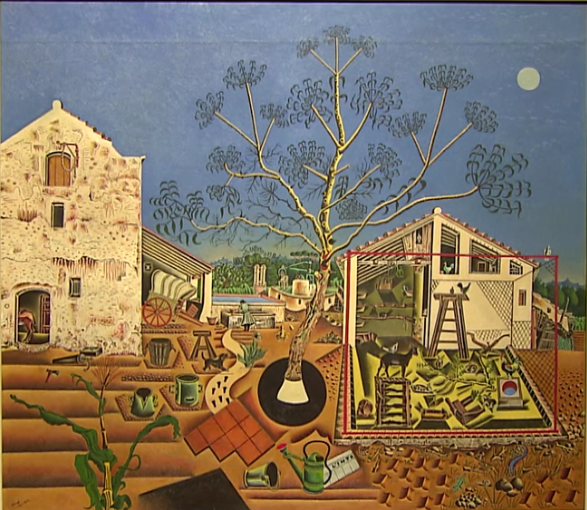 Miro’s studio Son Boter in Majorca conveys a sense of just how much he loved his home, where he collected things that inspired his artwork. Even during his surrealist period, his painting abounded with memories; paintings such as “Catalan Peasant with Guitar” from 1924 which depicts the barrentina, the traditional red cap of Catalan peasants. The hunger pains he suffered during the early years in Paris were Miro’s surprising explanation for the poetic imagery revealed in his paintings. What followed next were years of experimentation. Miro declared that he wanted to ‘assassinate’ painting. 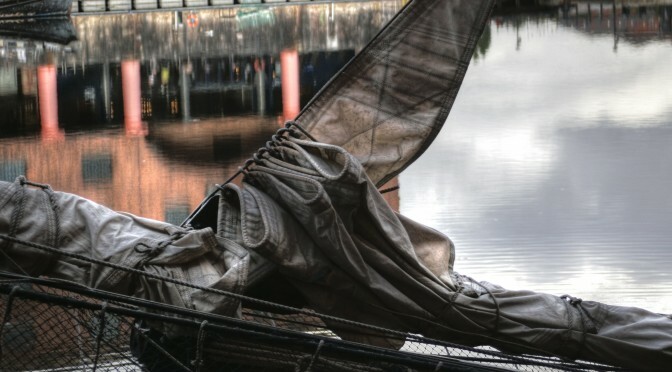 He panted on roofing felt, on Masonite boads, on sackcloth. The painting “Head of George Auric” of 1929 marks the beginning of this period. In certain pictures Miro seems to predate today’s graffiti art, as if he’d always carried a spray can of paint in his vest. The vastness of canvas is Miro’s great subject. He sees the painting as a white wall. 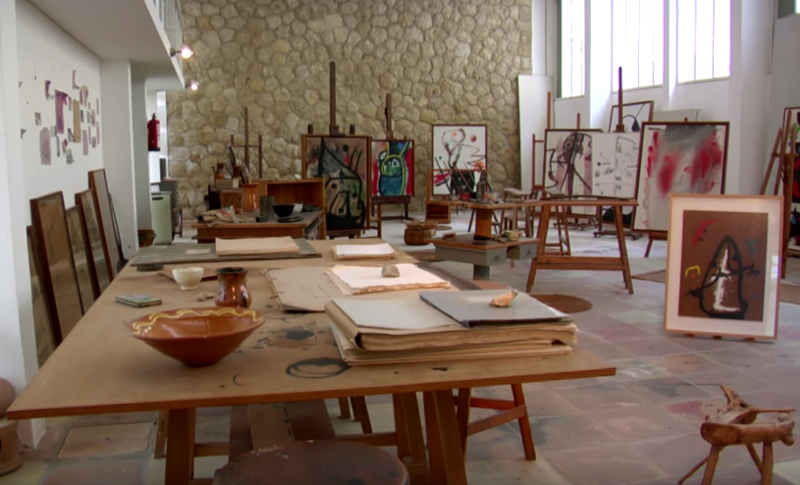 Studio in Palma de Majorca where he finally had space for large canvases. 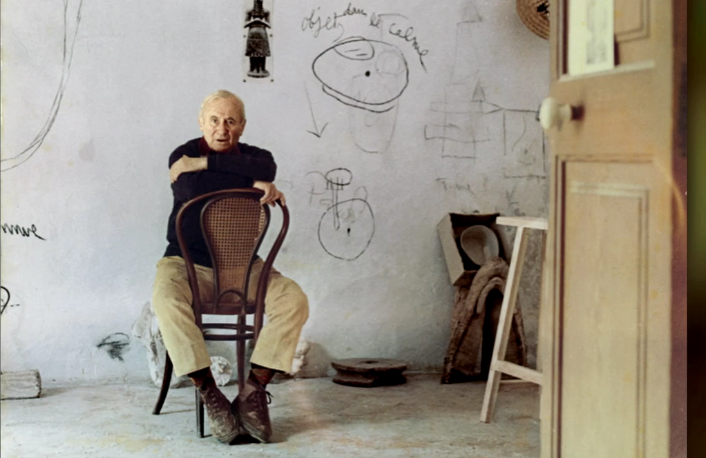 In 1956 the architect Josep Lluis Sert built Miro a studio in Palma de Majorca. After the second World War and Franco’s dictatorship, it became a place he retreated to. Finally he had enough space to pursue large formats. Also that year came the triptych Blue I, II, III, on huge canvases, a painting that conveys the observer into cosmic dimensions. Miro no longer wanted to paint for museums and galleries. He was working on designs for large ceramic walls to project his art to the public sphere and into the everyday life of people. These were joint projects, such as the one along the ocean promenade in Palma, and were carried out with Josep Illorens Artigas, an artist who worked with ceramic. 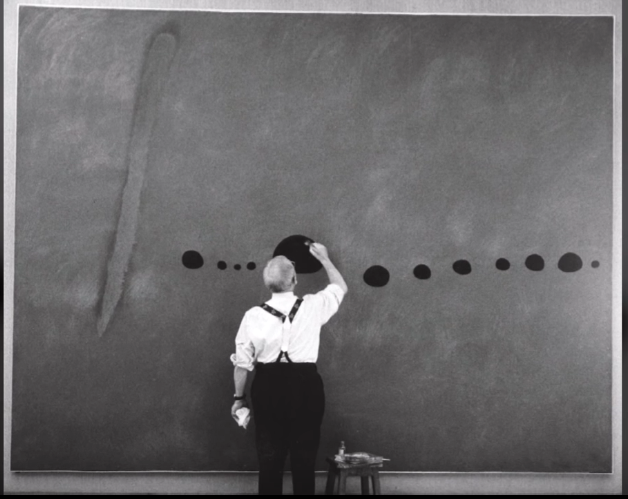 Miro used huge canvases to design his artwork for the public. They provide an impression of his concept of ideas. And a painting like “The Awakening of Madame Bou-Bou at Dawn” seemed to anticipate the sketches that he sketched directly onto the walls of his country home “Son Boter” which he had acquired as an addition to his modern studio. Miro used charcoal pencils to spontaneously capture his ideas for figures and sculptures on white walls. 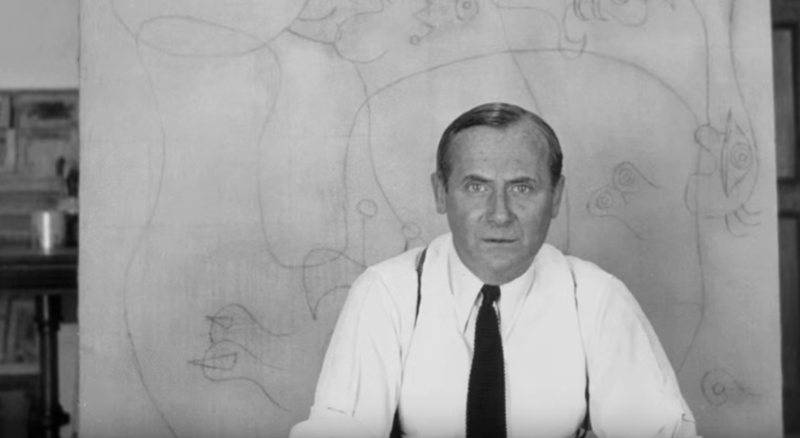 Jean Miro was an artist who continuously searched for ways to renew the art of painting. In reality even the old Miro was a young and wild artist at heart.